The Lutherie is the One-Stop Music Resource Centre Serving Southern Scotland & Beyond. They specialise in the following which they beleive is all you require to be able to get you playing, and keep on playing! 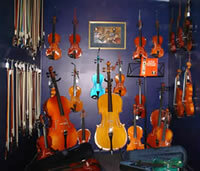 They carry a range of between 50 and 100 new and used violins, violas and cellos in stock including PRIMAVERA, PRIMA LOREATO, CONCERTANTE, and RAINBOW VIOLINS. Although, they have a limited display space which does not allow them to carry a full a range of guitars, they can still quote you the keenest prices for instruments from the following range: GIBSON, EPIPHONE, B.C. RICH, RICKENBACKER, C.R.BAGGS, SAMICK, FAITH, and BRUNSWICK. Instrument Hire is a service which The Lutherie provides for those who wish to take up an instrument without the commitment and expense of purchase they offer a range of new and secondhand instruments available for low cost hire. Their sister site, www.stringmail.co.uk is Europe's largest online music string store, and all listed items are available in their showroom at the same low 'web' prices.Stringmail would like to be the U.K's No.1 online supplier of music strings by offering the finest strings at the best prices and the finest service available. Their range of Guitar strings includes over 230 Different Sets! Acoustic, Electric, Bass, Jazz and Classical and all the popular brands are stocked: Augustine, D'Addario, Dean Markley Martin, Ernie Ball Slinky, Elixir, Fender Bullets, Fret Mate, John Pearse, La Bella, Maestro, Picato, Pro-Arte, Savarez Argentine, Thomastik. They also cater for wind & brass players, and carry one of the largest ranges of Reeds & accessories in Scotland. These can be seen on their website www.ReedExpress.co.uk. They carry a full range of woodwind and brass care products, including Padsavers, Mops, Mouthpiece savers,Cork grease, and Oil.